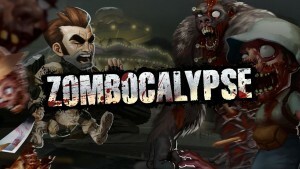 Zombocalypse | Play Online For Free !!!! Zombocalypse is a game that allows you to fight not only for the main threat but also for your life. Although most players find the game a bit challenging to play, understanding how to play it and what you should do during the game can make you win easily. As you begin Zombocalypse game, you will see crowds of different zombies reaching to stop you. It is all upon you at that moment and using various weapons to fight the crowds is what you should do. When the game starts, you will only have a machete since the zombies are few they are moderate as well. However, when you progress, you may realize the zombies are increasing significantly in their number. In this way, you will have to employ various weapons falling from the sky. Simply move to the box with the weapon that you need and hit arrow down button to receive it. Besides, make sure the zombies do not get near you as you might lose health and eat you in the end.